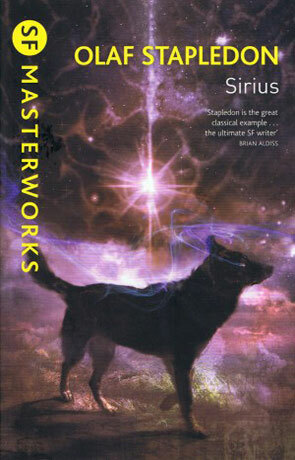 Sirius by Olaf Stapledon is a science fiction novel and part of the Gollancz SF Masterworks collection. I must admit that I often feel a small amount of awe by witnessing such talent that can reach out and communicate in such a powerful manner more than 60 years after they have passed the mortal plane, to leave such a literary voice so long after deaths sweet embrace is somewhat humbling. Sirius is pretty much a unique story and one that has no real parallel, there are of course other authors who have written from the viewpoint of a non-humanoid - Steven Baxter is a good example but none that I have read can match the vision nor complete immersion into a non-bepedal world that Stapledon has produced here. It's funny how it takes something that is outside of humanity to remind us of ourselves, ultimately - and somewhat ironically the novel is an exploration of the human condition, both from the point of view of a being outside of the human race looking in but more so in the way that for all his canine mannerisms Sirius is more human in many ways (with all it's strength's and weaknesses) than most of us. The story is narrated from the first person perspective of Robert, the Lover of Sirius soul mate and it's through his journey of discovery that we learn the unique and evocative tale of the life of the human hound. Many different aspects of humanity are examined, discussed and questioned through this odyssey including politics, theology, mortality, psychology and philosophy. Written almost 70 years ago the novel is as far removed from the tropes of the genre as is possible, set in a rural Welsh farming area leading up to the author's relative present of 1944 and although it has aged fantastically well by downplaying any science elements it's also a window into the past, a view of a simpler life but with all the dangers and prejudices that go with it. The descriptive use of the canine form is nothing short of genius, capturing the animal in a way I have never heard before and doing so in such an effortless fashion that I did not once question if any of the ways that the animal's behaved was accurate. Stapledon must have gone to a great depth of research and it really does show. Sirius is a somewhat poignant journey, incalculably emotive and immeasurably introspective, a true masterpiece of literary (science) fiction. Written on 27th April 2011 by Ant.